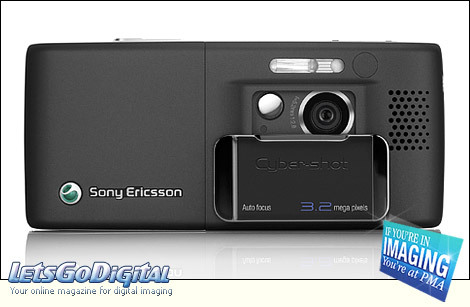 Sony Ericsson takes digital imaging in camera phones to new heights today with the launch of the Sony Ericsson K800 mobile camera phone, the first handset to carry the Cyber-shot brand, a true mark of imaging quality. The Sony Ericsson Cybershot K800 is a highly capable mobile phone with an integrated 3.2 Megapixel digital camera with Autofocus, Xenon flash and BestPic - Sony Ericsson's unique imaging technology that allows you to capture exactly the moment you desire. The Sony Ericsson K800 mobile camera phone combines advanced image capture capabilities with high speed data transfer, making it the perfect tool for shooting and sharing high quality pictures and videos. Sony Ericsson K800 Cybershot phone - "With the K800 Cybershot phone we aim to create a new lifestyle of 'imaging communication' by combining Sony Ericsson's unique mobile applications and Sony digital imaging technologies," said Rikko Sakaguchi, Senior Vice President, Product and Application Planning, Sony Ericsson. "Our aim has always been to innovate and create new values for the mobile life, and with the Cyber-shot phone we will enable anyone to enjoy an entirely new level of communication - taking quality pictures of anything, anytime and anywhere, and sharing their precious moments with others." 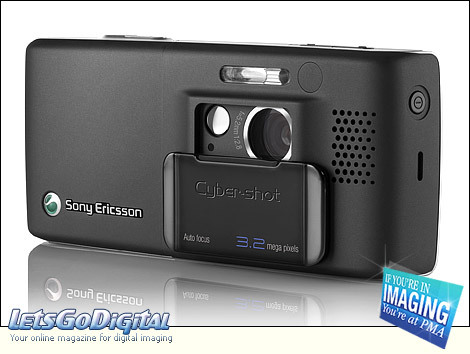 Sony Ericsson K800 mobile phone - Digital still camera & BestPic function - The Cybershot K800 is a dual-mode UMTS/GPRS phone. The handset of the Cybershot K800 mobile camera phone has a classic Sony Ericsson design, with a large screen and responsive, tactile keypad with a sleek and stylish dual front phone design. Turn the phone horizontally and there you have a digital still camera. Simply slide the active lens cover downwards and a user interface similar to that of a Cyber-shot camera automatically appears. A completely new feature developed by Sony Ericsson is BestPic, which ensures that you never 'miss' an important picture. Press the shutter button once and get 9 full quality 3.2 megapixel pictures to choose from in a time sequence - 4 pictures before and 4 pictures after the actual image you captured. All 9 pictures are displayed as icons on the display. Simply scroll backwards and forwards through the 9 images and save the ones you like best. Cybershot K800 mobile camera phone - PictBridge compatible - The Sony Ericsson K800 mobile phone offers full support for a complete digital imaging lifestyle. Printing is possible without the need for a PC thanks to PictBridge, a feature that transfers pictures directly to a printer by using a USB cable. Storing and managing image files on your PC are made easy with the supplied Adobe software, and the phones are among the first to feature fully integrated Picture Blogging Blogging is growing exponentially as a way of sharing personal experiences with words and images, and Picture Blogging in Cybershot K800 allows users to create and update personal blogs directly from the phone in just a few clicks. Sony Ericsson Cybershot K800 phone - Business users - Business users will find the K800 phone valuable work tools while out of the office and the sleek Velvet Black casing fits neatly with the professional image. Full HTML browsing with RSS feeds and Google Search give you high-speed, graphic-rich Internet use. Support for standard push email and a connectivity suite comprising Bluetooth 2.0, USB 2.0 and Memory Stick Micro (M2) means that keeping in touch is effortless. A complete entertainment package including music player, 3D gaming and an RDS FM radio are also provided for business downtime or relaxation.